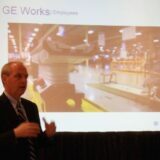 “We are realizing that times have changed, and we want to reflect that we are operating in a new, changing environment,” said Gary Sheffer, Vice President of Corporate Communications and Public Affairs at The General Electric Company. Gary presented at the National Summit on Strategic Communciations in April 2012. “If you take away one thing from what I say, our goal here is to shift our focus from GE’s tendency to make product the hero. We have great products, we should be proud of them, but our shift here is making our ‘impact’ the hero. It’s why GE works. It’s our impact on the world, and that’s what we want to declare loudly and proudly,” Gary added.